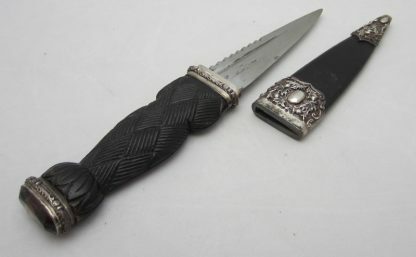 This sgian dubh dates from the early 1900s. It has silver fittings with a thistle design on the sheath and blade. This early 1900s Sgian Dubh has a wooden grip carved with a basket weave design. The silver fittings on the sheath feature an ornate thistle design. The knife itself has thin silver bands with a thistle design around the pommel and the base of the grip.